What I’ve realized by is that Policy Managed Databases are not widely used and there is a lot misunderstanding on how it works and some concerns about implementing it in production. My current employer Trivadis (@Trivadis, make sure to call us if your database needs a health check :-)) use PMDs as best practice, so it’s worth to spend some words on it. Isn’t it? If a pool has less than min servers, a server is moved from a pool that has more than min servers, starting with the one with lowest priority. If a pool has less than min servers and no other pools have more than min servers, the server is moved from the server with the lowest priority. Poolss with higher priority may give servers to pools with lower priority if the min server property is honored. This means that if a serverpool has the greatest priority, all other server pools can be reduced to satisfy the number of min servers. Generally speaking, when creating a policy managed database (can be existent off course!) it is assigned to a server pool rather than a single server. The pool is seen as an abstract resource where you can put workload on. PMD instances are created/removed automatically. This means that you can add and remove nodes nodes to/from the server pools or the whole cluster, the underlying databases will be expanded or shrinked following the new topology. Server Pools (that are the base for PMDs) allow to give different priorities to different groups of servers. This means that if correctly configured, you can loose several physical nodes without impacting your most critical applications and without reconfiguring the instances. 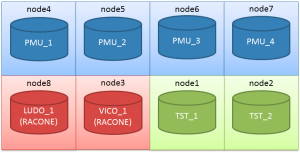 PMD are the base for Quality of Service management, a 11gR2 feature that does resource management cluster-wide to achieve predictable performances on critical applications/transactions. QOS is a really advanced topic so I warn you: do not use it without appropriate knowledge. Again, Trivadis has deep knowledge on it so you may want to contact us for a consulting service (and why not, perhaps I’ll try to blog about it in the future). 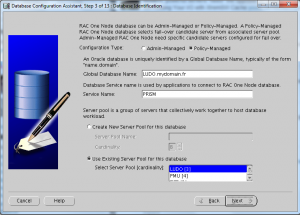 RAC One Node databases (RONDs?) can work beside PMDs to avoid instance proliferation for non critical applications. Oracle is pushing it to achieve maximum flexibility for the Cloud, so it’s a trendy technology that’s cool to implement! What changes in real-life DB administration? Well, the concept of having a relation Server -> Instance disappears, so at the very beginning you’ll have to be prepared to something dynamic (but once configured, things don’t change often). As Martin pointed out in his blog, you’ll need to configure server pools and think about pools of resources rather than individual configuration items. The spfile doesn’t contain any information related to specific instances, so the parameters must be database-wide. The oratab will contain only the dbname, not the instance name, and the dbname is present in oratab disregarding if the server belongs to a serverpool or another. Your scripts should take care of this. An approach for the crontab: every DBA soon or late will need to schedule tasks within the crond. 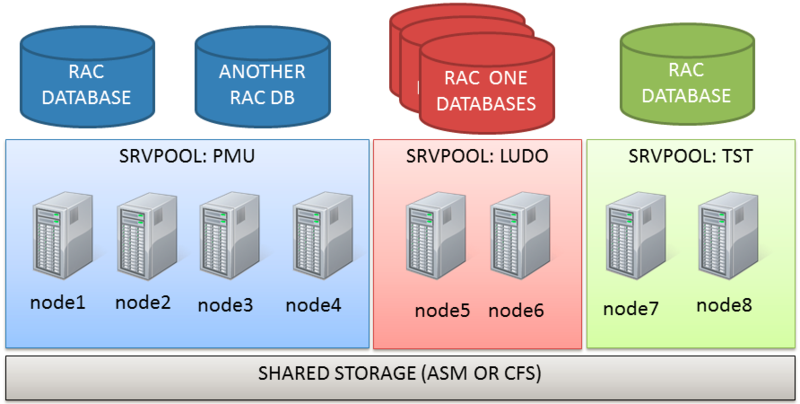 Since the RAC have multiple nodes, you don’t want to run the same script many times but rather choose which node will execute it. In the example, TST_1 is running on node1, so the first evaluation returns TRUE. The second evaluation is done after the node2, so it returns FALSE. This trick can be used to have an identical crontab on every server and choose at the runtime if the local server is the preferred to run tasks for the specified database. My good colleague Jacques Kostic has given me the access to a enterprise-grade private lab so I can show you some “live operations”. Let’s start with the actual topology: it’s an 8-node stretched RAC with ASM diskgroups with failgroups on the remote site. This should be enough to show you some capabilities of server pools. The Generic one will contain all non-PMDs (if you use only PMDs it will be empty). The Free one will own servers that are “spare”, when all server pools have reached the maximum size thus they’re not requiring more servers. (the node assignment in the graphic is not relevant here). “srvctl -h ” is a good starting point to have a quick reference of the syntax. In this scenario, PMU is too big. 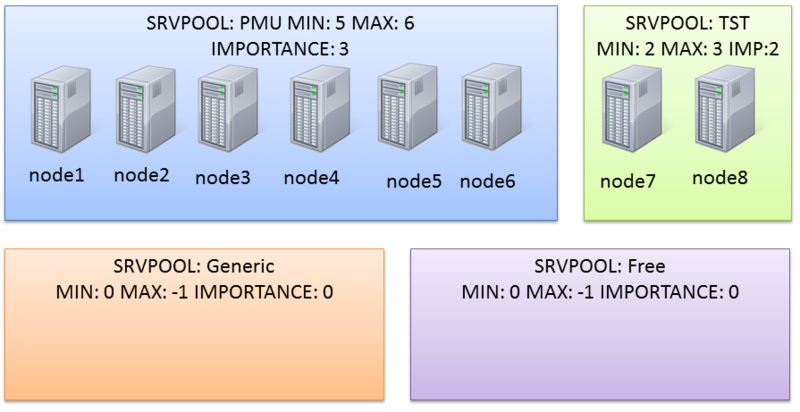 The sum of minumum nodes is 2+5=7 nodes, so I have only one server that can be used for another server pool without falling below the minimum number of nodes. Notice that PMU maxsize is still 6, so I don’t have free servers yet. The clusterware proposes to stop 2 instances from the db pmu on the serverpool PMU because it can reduce from 6 to 3, but I have to confirm the operation with the flag -f.
Modifying the serverpool layout can take time if resources have to be started/stopped. 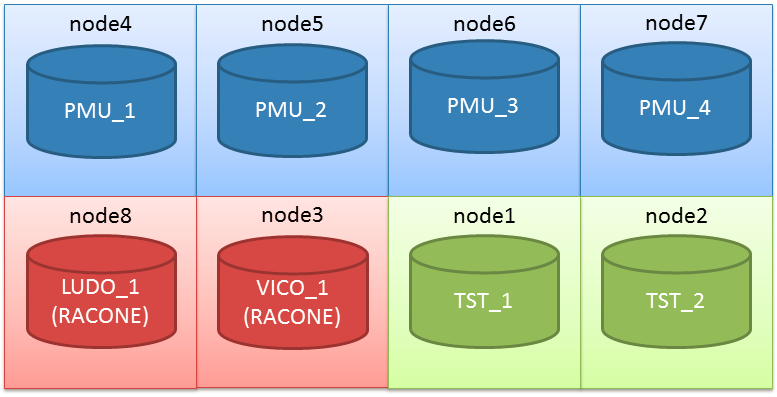 My new serverpool is finally composed by two nodes only, because I’ve set an importance of 1 (PMU wins as it has an importance of 3). Now that I have some room on my new serverpool, I can start creating new databases. With PMD I can add two types of databases: RAC or RACONDENODE. Depending on the choice, I’ll have a database running on ALL NODES OF THE SERVER POOL or on ONE NODE ONLY. This is a kind of limitation in my opinion, hope Oracle will improve it in the near future: would be great to specify the cardinality also at database level. With this situation, what happens if I loose (stop) one node? A server has been taken from the pol PMU and given to the pool LUDO. This is because PMU was having one more server than his minimum server requirement. So, my hyper-super-critical application will still have three nodes to have plenty of resources to run even with a multiple physical failure, as it is the server pool with the highest priority and a minimum required server number of 3. 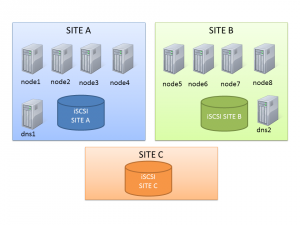 Server Pools that are aware of the physical location when I use stretched clusters, so I could end up always with “at least one active instance per site”. The installation process of a typical Standard Edition RAC does not differ from the Enterprise Edition. To achieve a successful installation refer to the nice quick guide made by Yury Velikanov and change accordingly the Edition when installing the DB software. 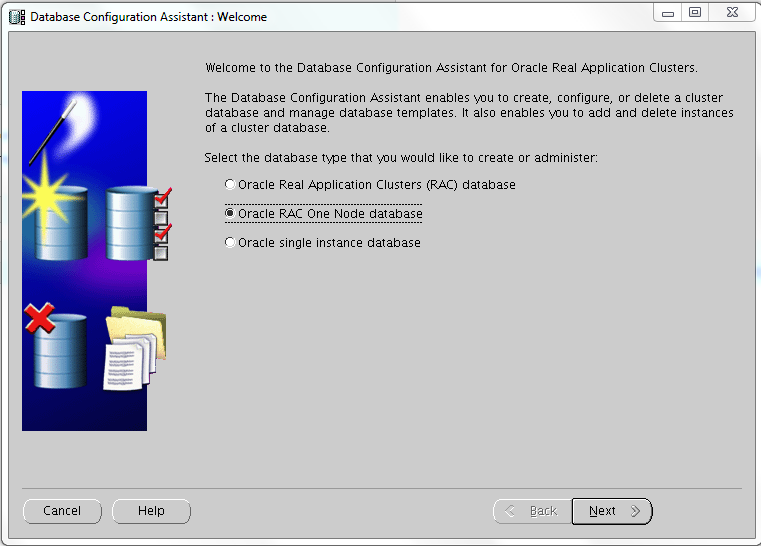 The first thing that impressed me, is that you’re still able to choose to enable pluggable databases in DBCA even if Multitenant option is not available for the SE. So I decided to create a container database CDB01 using template files, so all options of EE are normally cabled into the new DB. The Pluggable Database name is PDB01. As you can see, the initial banner contains “Real Application Clusters and Automatic Storage Management options“. Multitenant option is not avilable. How SE reacts to its usage? First, on the ROOT db, dba_feature_usage_statistics is empty. This is interesting, because all features are in (remember it’s created from the generic template) , so the feature check is moved from the ROOT to the pluggable databases. Having ONE PDB is not triggering the usage of Multitenant (as I was expecting). How if I try to create a new pluggable database? A-AH!! Correctly, I can have a maximum of ONE pluggable database in my container. I’ve just followed the steps to do it on an EE. Keep in mind that I’m using admin managed DB (something will come about policy managed DBs, stay tuned). Then I can access my DB (and preferred instance) using the service_name I specified. 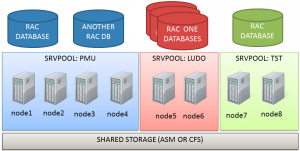 Let me know what do you think about SE RAC on 12c. It is valuable for you?